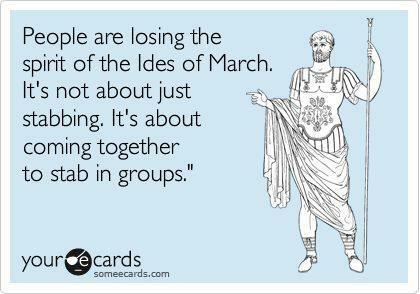 I neglected to mention, or plan for, the Ides of March in my "special holiday" menu plan on Monday. Whoops. Missed another "holiday." What would you serve for an Ides of March party? Caesar salad? Blood oranges? Things on skewers? The good thing is, March has an Ides every year, so I get more chances. The even better thing is, I can continue to ignore it if I wish. The folks over at the radio station I listen to most are calling today John 3.16 day. I like it. Even though it doesn't involve food. Locusts and wild honey, maybe? I'm plumb out of locusts, but maybe I should whip up a batch of homemade "Clif" bars. They have honey in them. Or bread, I suppose. Bread containing wild honey and locusts? Whew, that was quite a night last night! I'm not sure if I can continue to blame it on daylight savings, but Bubby has been having a heck of a time falling asleep this week. Isn't it generally accepted that it takes 1 day per hour of time change to get a body back on schedule? But here it is, four days in, and Bubby and I both are not sleeping (and not just because he's keeping me awake). Last night, Bubby ended up sleeping in a sleeping bag on our bedroom floor. At least he did fall asleep eventually--at 1:18 and 2:37 and 3:14 a.m., and every time in between, that was not a sure thing. For Bubby, it's not just a disruption to his inner clock that's disturbing his sleep rhythm. He's also experiencing fear of an unspecified nature. Like, he's scared to tears, but not sure why. And that scares me. Because irrational fear is not only impossible to reason away, it is also crossing into territories that I don't want to visit, alone, or with any of my children or my husband. I'm trying, and mostly succeeding, not to panic, but panic resides closer to the surface in a sleep deprived landscape. Fortunately, we have the assurance of God's unfailing love to chase away the darkness--the fear, the hurt, the confusion, the panic, the anxiety. Here's praying for a sleep-filled and fear-free night, tonight.